Green-Flowered Liparis is a variable, small to medium sized, hot to cold growing orchid found growing on trees, ground or rocks, occuring in broadleaf, evergreen, lowland forests on highly eroded, stratified limestone cliffs and bluffs at 300 to 2500 m. It has short and ovoid to long and cylindric pseudobulbs carrying 2, obovate-oblong or inverted-lanceshaped, blunt, pointed or tapering leaves. 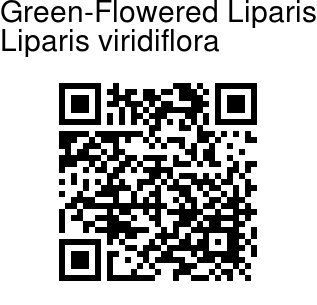 The plant blooms in the late fall to early winter on an erect, cylindric, up to 25 cm long, slender, densely many flowered, raceme-like inflorescence with small, lanceshaped, tapering, scarious bracts and very small, crowded flowers. 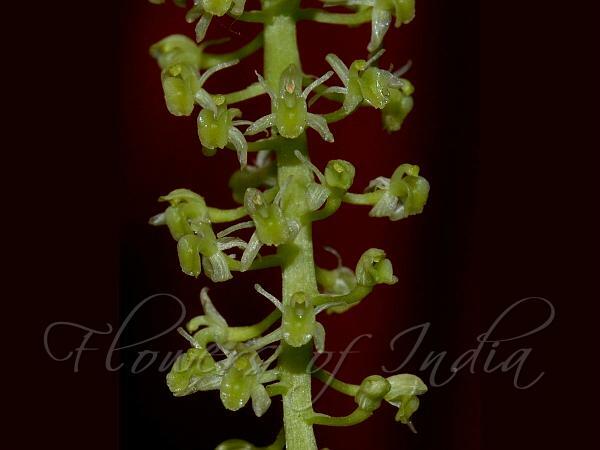 Flowers are greenish white or pale greenish yellow; flower-stalk and ovary 4-7 mm. Dorsal sepal nearly elliptic-oblong, 2-3 × 0.8-1 mm, margin curled, tip blunt; lateral sepals ovate-elliptic, slightly wider than dorsal sepal. Petals are narrowly linear, 2-3 × about 0.3 mm, tip rounded; lip recurved from middle, nearly ovate-oblong, 2-3 × about 1.7 mm, base ecallose, margin slightly wavy, tip subpointed or mucronate. Column is slightly arcuate, 1.5-2 mm, base slightly enlarged, tip winged. Capsule is obovoid-ellipsoid, 4-6 × 3-4 mm; fruiting flower-stalk 3-6 mm. Green-Flowered Liparis is found in the Himalayas, from Kumaun to Bhutan, Assam, Khasi Hills, South India, Ceylon, S. China, Taiwan, at altitudes of 700-2500 m.
Identification credit: Ravee Bhat Photographed in Bangalore, Karnataka.